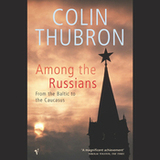 Where Nights Are Longest: Travels by Car Through Western Russia by Colin Thubron (re-issued as Among the Russians ) will likely be more interesting in about twenty years. A travel memoir written in 1983 before the dissolution of the Soviet Union seems dated now, but its historic value will endure. My goal in my reading plan was to read and release, to clear off my bookshelves. I didn’t account for Thubron’s elegant prose and cogent commentary. Alas, I must keep this book, if only to pick it up and feed on the phrases later. Three things I liked: 1) I saw the essential religious nature of life. In the former Soviet Union the Soviet State presides in the place of God. Thubron’s continual framing of the secular culture in religious terms fascinated me. Small wonder that the usurping creed had to mimic them [pre-revolutionary churches]. All through Stalin’s reign public buildings subconsciously strained for religious effect, and frogmarched into service half the paraphernalia of classical paganism. Birth, marriage, death–there is no state ritual which can invest such moments with the same perspective as the Church does. Secular funerals are desultory affairs, and state-run weddings ring hollow: not because God is not there–that cannot be helped–but because a spurious effort is made to keep the trappings of religiosity where the promises of religion don’t apply. 2) The snapshots of quotidian life and the average Russian/Armenian/Estonian/Georgian citizen. Thubron, a solitary traveler, has a talent for engaging folk in extended conversation. He drank volumes of vodka–it seems to be a prerequisite to talk–but one gets an idea of how the common man perceived his life. 3) I have a latent love of Russian literature. I’ve read Tolstoy and Dostoevsky, Chekhov and Solzhenitsyn…but they are a fading memory. Thubron goes on a pilgrimage to homes, graves, and villages, visits with Pasternak’s daughter, takes in Tolstoy’s home, Turgenev’s estate. After reading those chapters, I wanted to clear my schedule and immerse myself in those thick books full of patronymic confusion and clear thinking. His hand groped for a glass and I guessed that he was about to propose a toast to Stalin. I think I turned white. I made no move. I imagined the evening’s camaraderie plummeting into wounded national pride and breached hospitality. Yet no, I could not toast Stalin. Facing the Congo: A Modern-Day Journey into the Heart of Darkness is, perhaps, a photo-negative of the book Endurance . In it, men take on daring risks…and why? Because places are awaiting exploration. One story is set on the Congo River on the Equator, the other at the South Pole. Both books speak of journeys taken with the knowledge that the final outcome may be death. Jeffrey Taylor’s adventure is 90% existential self-actualization, a proving to himself of his own worth. Though he faces extreme physical hardship, especially suffocating heat, his greatest peril comes from traveling in Zaire, an unstable country made violent by the policies of the dictator, Mobutu. There is no evening on the equator. The sun falls promptly at six and rises at six: every equatorial night is the obverse in time of every equatorial day, a coin flipping now light, now dark, with a band of fifteen minutes of resplendent dawn or lustrous dark in between. Taylor’s prose is graceful, but his perceptions often fall flat. His descriptions of poverty are persuasive, his sketches of the Africans he meets fill your mind. There were sections of the river–cannibal territory–so dramatic, I had to read while I blew-dry my hair. The tension dissolves into an empty ending with precious few lessons to take home. This book makes me want to read Joseph Conrad’s Heart of Darkness , one of those classics which escaped my high school lit classes. Thubron’s book makes me want to read all his travel books . This entry was posted in Uncategorized and tagged bookreview by alivingpencil. Bookmark the permalink. Ooooh, that first book sounds awesome! Thubron’s book is going on my wish list. The other one sounds like so many of the books by self-styled modern adventurers – not about exploration or travel, but more about thrill-seeking for pleasure. Have you ever read Michael Nicholson’s book, Across the Limpopo? He wasn’t in it for exploration either, but he took his family on a 4,000 mile trip through Africa so his children could see Africa before the political situation in various areas of the continent got too dangerous. As it was, it was still a pretty risky trip. @hiddenart – Let me know how you like it. I keep seeing new titles to add, but that won’t help my effort to thin my bookshelves!